While reading through old news paper articles looking for various pieces of information, I ran across the following series of articles. The series only lasts for two months, but there is a huge amount of interesting history of Portland Oregon contained in these articles. From the October 05, 1921 Oregonian. 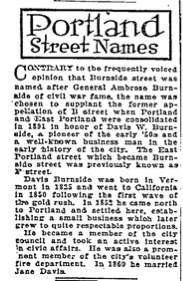 Contrary to the frequently voiced opinion that Burnside street was named after General Ambrose Burnside of civil war fame, the name was chosen to supplant the former appellation of B street when Portland and East Portland were consolidated in 1891 in honor of Davis W. Burnside, a pioneer of the early ’50’s and a well-known business man in the early history of the city. The East Portland Street which became Burnside Street, was previously known as F Street. Davis Burnside was born in Vermont in 1825 and went to California in 1850 following the first wave of the gold rush. In 1852 he came north to Portland and settled here, establishing a small business which later grew to quite respectable proportions. He became a member of the city council and took an active interest in civic affairs. He was also a prominent member of the city’s volunteer fire department. In 1860 he married Jane Davis.